Professional buyers related to Processing & Food Engineering are invited to apply for the Hosted Buyers program before March 4th. Not only will it enhance business development, it provides business matchmaking, and lots of benefits during your visit at the show. Download the PDF and learn the details of the Hosted Buyers program. Do you want fries with your chicken? Be Media Focus (Thailand) Co Ltd.
Guangzhou Cohoo Bio-tech Co. Ltd.
HANGZHOU XIAOTENG INDUSTRIES Co. Ltd.
Ningbo Connect Machinery Equipment Co Ltd.
Ningbo Longxing Chemical Technology Co. Ltd. Owner Foods Machinery Co. Ltd.
Shanghai Frontan Animal Health Co. Ltd. 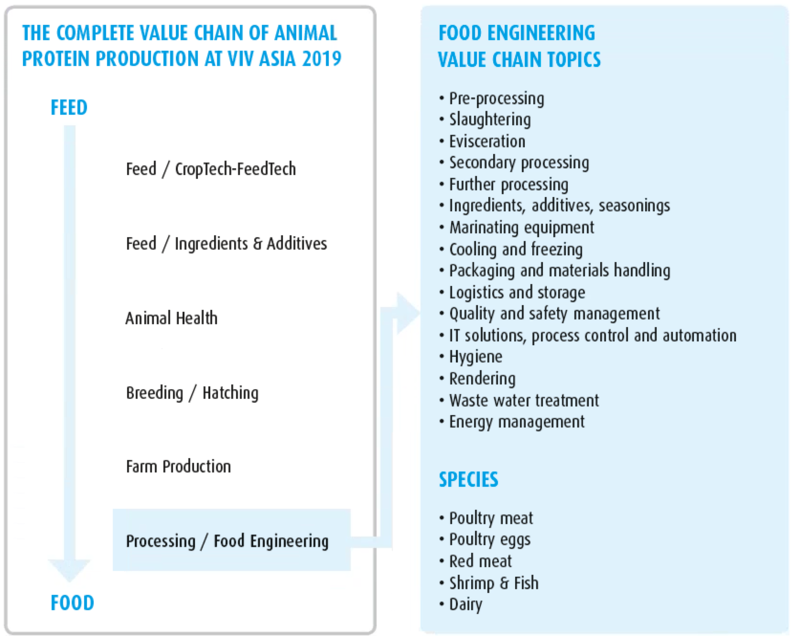 The exhibition space that is reserved for Food Engineering is doubled, compared to the slaughtering & processing section of VIV Asia 2017. 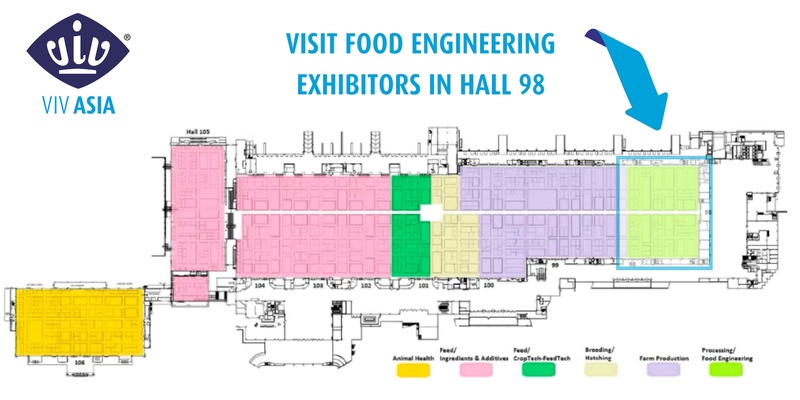 Over 100 global suppliers will present their equipment, products and services in further processing, logistics, refrigeration, food/ meat ingredients, and packaging in Hall 98. Undoubtedly the most sought-after service that has grown in demand over the previous editions of VIV Asia. 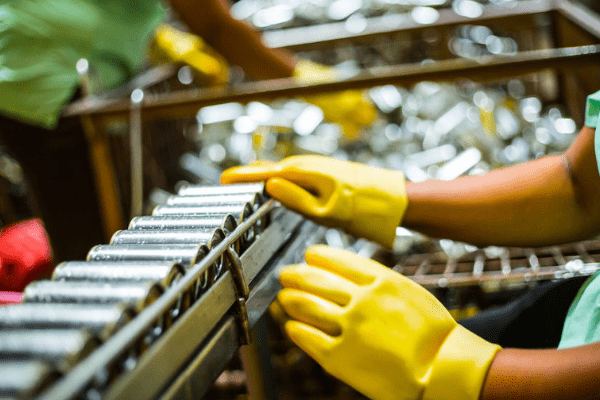 Food Engineering takes place when the slaughtering part begins, when companies step in to process the product before it hits the market and the retail business. How do we engineer it? VIV team analyses market trends, opportunities and current needs and links industry professionals through the vertical chain in the target market. 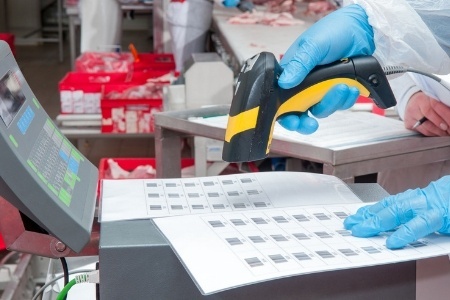 A wide array of services covering conferences, summits (seminars) and exhibitors presenting equipment for slaughtering, processing & handling, cold chain, and packaging of red meat, seafood, table eggs & poultry products… the good-old VIV recipe, going beyond a simple showcase. 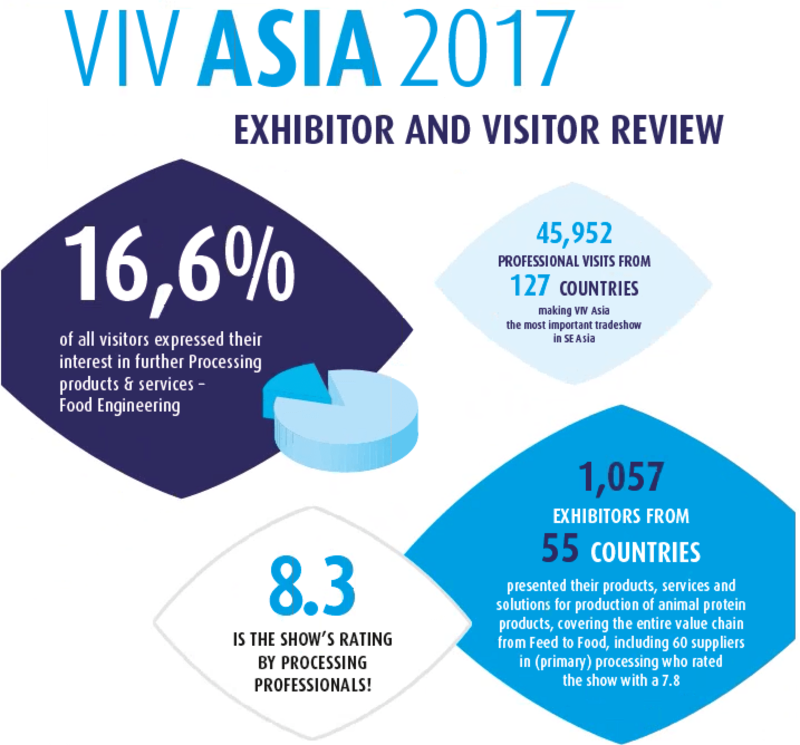 VIV Asia 2017 hosted over 60 companies related to slaughtering and further processing, while 16.6% of the total visitors in 2017 indicated slaughtering and processing as a sector in their interest.